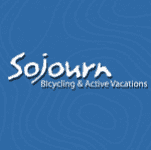 For over 15 years Sojourn has been offering award-winning luxury bicycling and multi-sport active vacations while pioneering many of their destinations. The experience includes stays in high-end boutique and 5-star accommodations, finest farm to table cuisine, world-class leaders and well-crafted routes catering to every level of cyclists. Sojourn trips curate travel experiences that immerse in the culture and lifestyle of the amazing locales. Sojourn was founded in 2004 by a collection of experienced travel business professionals and is currently owned by Raja & Bibi Mukherjee, a couple with a huge passion for biking and travel. Sojourn bikes are issued with flat pedals. If you usually ride with clipless pedals (SPD or similar) it is recommended that you remove your pedals from your bike and bring them with you on the tour. On arrival, your tour leaders will install your pedals on your bike for use during your bike trip. When on a Sojourn tour, the use of one of their state of the art, professionally maintained bikes are included in your tour cost. Generally, 90% of the travelers take advantage of using a Sojourn bike on tour however, if you’re partial to your own bike, feel free to bring it. Tandem bikes are available for experienced tandem cyclists on certain trips (additional fee applies, please contact our team of Travel Experts for further information). Tipping is not compulsory on the tours however your tour leaders will work very hard to ensure that your vacation is as carefree and enjoyable as you could possibly imagine so if you would like to leave a tip it is at your own discretion. If another solo-traveller of the same gender also expresses interest in a room-share, Sojourn can room you together. Please contact our team of Travel Experts for further information. Sojourn trips typically cap their tours at 18 guests. With two tour leaders accompanying each trip, Sojourn guests enjoy one of the highest guides to guest ratios of all bike tour companies. This means more personalized attention for you! On the tours, you will likely encounter couples, singles, or friends and family members travelling together. Sojourn travellers generally range between the ages of 35 and 65 and share a youthful spirit of adventure.